What is the TubeCube® System and How Does it Work? WHK’s TubeCube® Tubing Connector System (Patent Pending) is the industry’s most convenient way to connect several different tubing types and sizes to one single connection point. The innovative design creates a virtually leak-proof seal between tubes while providing a smooth inner bore with unrestricted fluid flow path. See how they’re put together here. What are the Advantages of the TubeCube® Tubing Connector System? 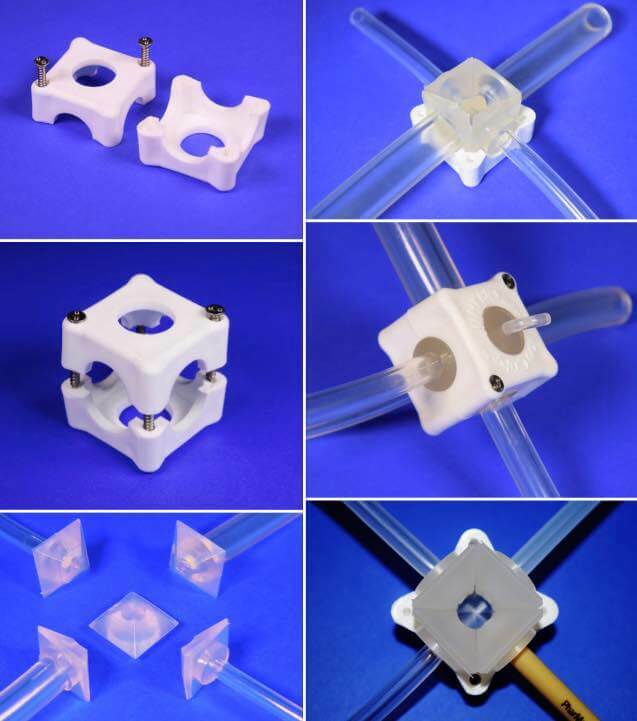 Join different tube sizes in a single TubeCube® eliminating the need for step-down connections. Depending on complexity, quantity and availability of parts, our lead times are usually between 4 to 6 weeks from receipt of P.O. and final approval of drawings, not 14 to 16 weeks like the other guys. Advantaflex® is a registered trademark of New Age Industries. C-Flex® and Pharmed® are registered trademarks of Saint-Gobain Performance Plastics. Want more information or a free sample? Call us at 855-WHK-BIO1 (855-945-2461) or (727) 209-8404 or e-mail us or request a sample below. To receive your product sample, simply complete the form below.